The first Minerva is a cruise ship built in 1989, and originally intended as a Soviet research vessel, the Okean. 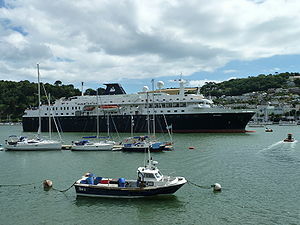 The deal to purchase her fell through and she was purchased by Swan Hellenic (at the time a subsidiary of P&O Cruises) in 1996, and renamed Minerva. She is 436 feet long, has a beam of 65.6 feet and measures 12,500 gross tons. She sailed with Swan Hellenic until her lease ran out in 2003. She briefly sailed with Saga Cruises as the Saga Pearl, and was then chartered to Abercrombie & Kent as the Explorer II, making voyages to Antarctica and South America from December to April with up to 198 passengers. From May to November, she sailed for the German-owned travel company Phoenix Reisen as the Alexander von Humboldt. In July 2007 it was announced that the ship has been acquired by the re-launched Swan Hellenic line and the name will revert to Minerva. ↑ "Minerva tours". Abercrombie & Kent. http://www.abercrombiekent.com/index.cfm?navid=3.2.4&Antarctica/Minerva/Cruise/Luxury-Ship-Tours. Ward, Douglas. Ocean Cruising and Cruise Ships 2005-2007. Berlitz. "MV Minerva – Facts & Figures". Swan Hellenic. http://www.swanhellenic.com/ship.html?shipid=895&pagetype=33. This page was last edited on 31 July 2010, at 18:48.